An action crime thriller and Peter O'Toole's final film, Diamond Cartel is notable for somehow collecting some famous actors who should know better and throwing them into a Grade Z Kazakh production. The barely comprehensible plot involves two lovers caught up in a feud between numerous gangsters somewhere between Siberia and Kazakhstan. 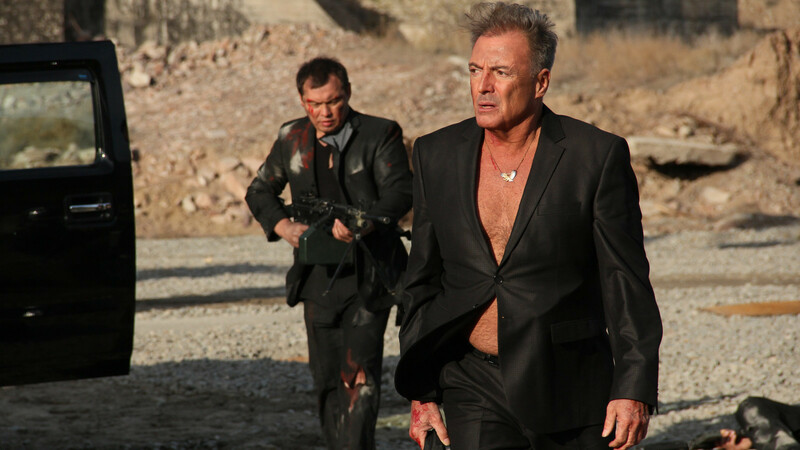 Gang boss Mussa (Armand Assante) attempts to negotiate a $30 million deal to purchase a massive diamond from a Mr. Liu. But the exchange, which includes a brief appearance by an undefined Mr. Mike (Michael Madsen), is violently disrupted by the crew of Mussa's disgruntled henchman (played by Nurlan Altaev). The bloodbath triggers an unexpected reunion between Aliya (Karlygash Mukhamedzhanova) and her childhood friend and former lover (actor Aleksey Frandetti), a soft-spoken non-violent man. Aliya was forced into becoming an assassin by Mussa. Now in possession of both the diamond and the $30 million, Aliya and Frandetti traverse Kazakhstan from end to end, hotly pursued by a large group of heavily armed bad guys. At the end of the journey is none other than Peter O'Toole as a crusty boathouse keeper, waiting to deliver his final two minutes of screen time. O'Toole passed away in 2013. His last role was in this film, initially called The Whole World At Our Feet and released in the local Kazakh market in 2015. Two years later the film was redubbed, re-edited and renamed as Diamond Cartel, and released more widely. Directed by Salamat Mukhammed-Ali, Diamond Cartel is a throwback to low budget mindless 1980s action movies. Horrifically dubbed (even the English-speaking actors appear victimized) with stupefyingly plastic dialogue, and featuring acting talent that oscillates between non-existent to over-the-top, this is an impenetrable chase film, serving intermittently as a Kazakh tourist video and otherwise aiming for ultra violent set-pieces delivered with no wit and less context. To be fair, as a viewing experience it's not a total loss. The production values are decent, director Mukhammed-Ali does demonstrate regular doses of in-your-face panache, and leading lady Mukhamedzhanova shows flashes of promise. The film is delivered with a vivid, almost over-exposed colour palette, and the combination of a stark aesthetic bolted onto a bizarrely disjointed plot manages to hold interest, if not always for the right reasons. And then there is Armand Assante, the one recognizable import with substantive screen time. He spends the film establishing a new fashion trend of slick jackets with no shirt underneath, and bites into the Kazakh scenery with unrestrained venom. A so-bad-it's-bad curiosity, Diamond Cartel has shiny star names but the glitter is all fake.